The emu (Dromaius novaehollandiae) is an iconic Australian bird that is incapable of flight. Although these birds cannot fly, they possess sturdy and lengthy limbs that allow them to manage high running speeds. These tall creatures are classified as ratites -- a group of birds that also includes both ostriches and kiwis. Emus are deep brown or grayish-brown in coloration, with barely visible wings. The mostly solitary birds have bluish-tinged necks and faces. Emus usually weigh between 79 and 88 pounds, notes the University of Michigan's Animal Diversity Web. Their bodies are usually approximately 75 inches long. These omnivores forage during the day hours, with diets that consist of bugs, tender shoots, foliage, seeds, caterpillars, flowers, fruit and tiny mammals. Emus also readily consume the stools of other animals. Not only are emus speedy runners, they're proficient swimmers too. The emu reproduction season takes place each year during the Southern Hemisphere's summer months -- think December and January. Emus come from Australia, and live only in Australia. Throughout the continent, they have a broad scope, touching almost every spot of it. Emus are somewhat less prevalent in the middle of the continent, however, and also in its eastern coastal regions. 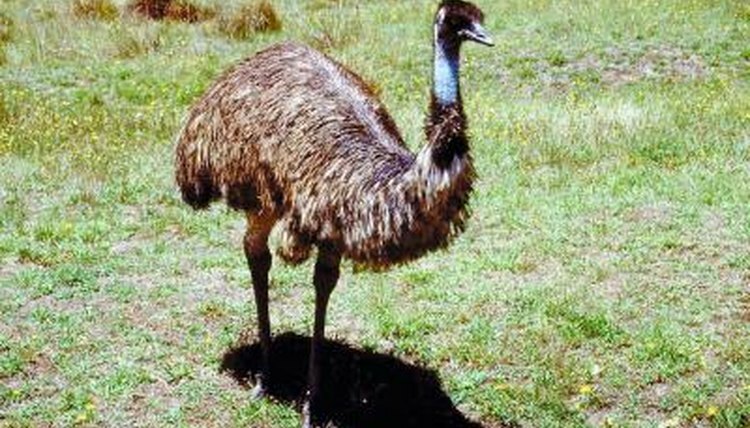 The population of total emus is believed to be sizable, with well over 10,000 adult specimens, as of the International Union for Conservation of Nature's 2012 report. In terms of landscapes, emus are diverse birds. They live in many types of settings, including grasslands, savannahs, eucalyptus forest and plains of deserts. If ample fresh H20 is accessible nearby, emus can generally manage, as water is necessary every single day. They are uncommon, however, in extremely arid environments, and also in rain forests, thick forests and urban locales. Emus essentially own their surroundings in Australia. Not only are they versatile in terms of natural habitat, they have been taking up residence all over the continent for a minimum of 80 million years, according to the Oakland Zoo. They also have strong and consistent numbers, notes the IUCN Red List of Threatened Species' 2012 determination. Emus are "least concern" birds, which means that they have no prominent risk of endangerment.